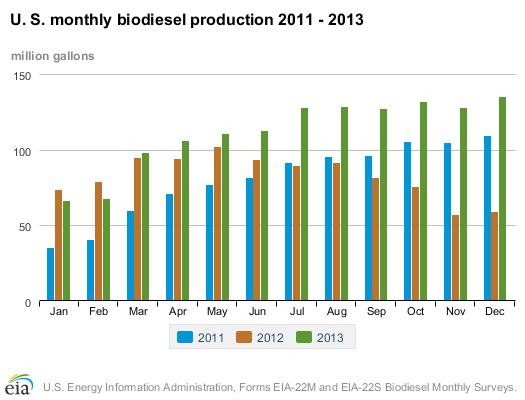 Production - U.S. production of biodiesel was 135 million gallons in December 2013. Biodiesel production during December 2013 was about 7 million gallons higher than production in November 2013. Biodiesel production from the Midwest region (Petroleum Administration for Defense District 2) was 64 percent of the U.S. total. Production came from 115 biodiesel plants with capacity of 2.2 billion gallons per year. Sales - Producer sales of biodiesel during December 2013 included 79 million gallons sold as B100 (100% biodiesel) and an additional 69 million gallons of B100 sold in biodiesel blends with diesel fuel derived from petroleum. Feedstocks - There were a total of 1,029 million pounds of feedstocks used to produce biodiesel in December 2013. Soybean oil remained the largest biodiesel feedstock during December 2013 with 559 million pounds consumed. New Public CNG Station Opens In Orlando, Fla.